Location: The Martin dam is located in Elmore County, AL on river mile 420.0 above Mobile, Alabama on the Tallapoosa River near Dadeville, AL. 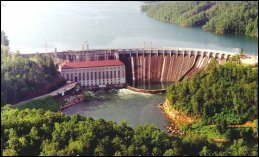 The Martin dam is located 77 river miles downstream from the Harris dam and 8 river miles upstream from the Yates dam. History: Martin Dam was the first of four dams constructed on the Talapoosa River. When it was built, the dam created the world's largest artificial body of water. Statistics: The concrete gravity dam is 2,000 feet long and has a maximum height of 168 feet. The dam's volume of concrete is 431,000 cubic yards. There are 20 gated spillways. Recent: The dam has been strengthened to withstand a new flood level of 15 feet over the dam. To strengthen the dam, a large hole was drilled from the top of the dam down through to the bedrock. A bundle of steel cables was lowered and anchored into the bedrock with epoxy. The cables were stretched tight and the hole was filled with concrete. So far, the biggest flood has been 6 inches over the dam.